We made our long drive back from New Mexico the last two days. Wes and I have been in the Land of Enchantment for just about a month. Three weeks at Camp Blue Haven and then almost another week in Red River at the Red River Family Encampment. I downloaded all of my pictures from this adventure and I have over 2000. Whew...these graduation pics were at the top so I thought that I would start there. It seems like MONTHS ago that Wes had his graduation ceremony. Life sure does go on. Truly, I am thankful that our boys are out of high school and are moving on. There are such great times ahead for them with good friends and college activities. This picture below is Wes with two of his best friends from school. We are thankful for you Ethan and Devin! Gonna miss seeing you guys! I have so much I want to share with you from the past month. Having been at CBH for three weeks was such a great blessing. Little brother Michael preaching Britni and Jared's wedding. I love it when God brings two lovely people together to enjoy life and to bless the people around them. God is so good. I have never seen a more beautiful wedding ceremony. Only God's decoration. Could not have been more beautiful. We are still enjoying the lovely mountains in Northern New Mexico. Cool and breezy. Praying for rain for Texas, New Mexico and Arizona. When is the Texas heat wave going to end? It seems we are having such weather extremes. Goodness. Wes and I are up in the beautiful mountains of New Mexico while Sid is home working away in the Texas heat. Sorry honey. First session of camp was so wonderful. Like I have said before...a little taste of heaven. We all learned so much. Campers and adults alike. Friendships were strengthened and spiritual renewal was felt. He will put on this cap and gown and walk across that stage and say goodbye to his childhood. I am thrilled for him and we are looking forward to the next chapter in his life. My heart is feeling a little achy but I am trying to ignore it. I figure I can dwell on it later. Today is not a day for crying, but a day for being joyful and celebration! God has great things planned for this boy. I can't wait to watch his life play out through God's orchestration. Once again Wes...this verse comes to mind. We love you little one. Blessings. Everyone here in the town where I live love Azaleas. I love them too. They are everywhere in the spring and are breathtaking. The flower below really steals my heart though. These are in the flower bed at church. 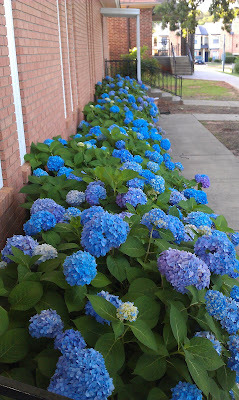 Most people wait for Azalea time but I wait for Hydrangea time. So big and colorful and happy. Lovely.